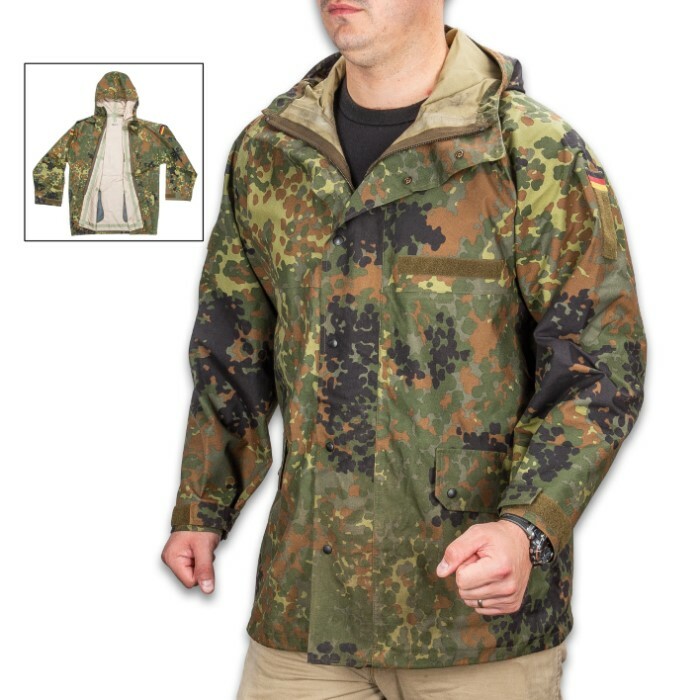 German Military Surplus Wet Weather Jacket - Flecktarn Camo - Gore-Tex - Hood, Adjustable Cuffs, Pockets - Tough yet Lightweight, Waterproof yet Breathable - Used - Hunting Fishing Outdoors Tactical | BUDK.com - Knives & Swords At The Lowest Prices! 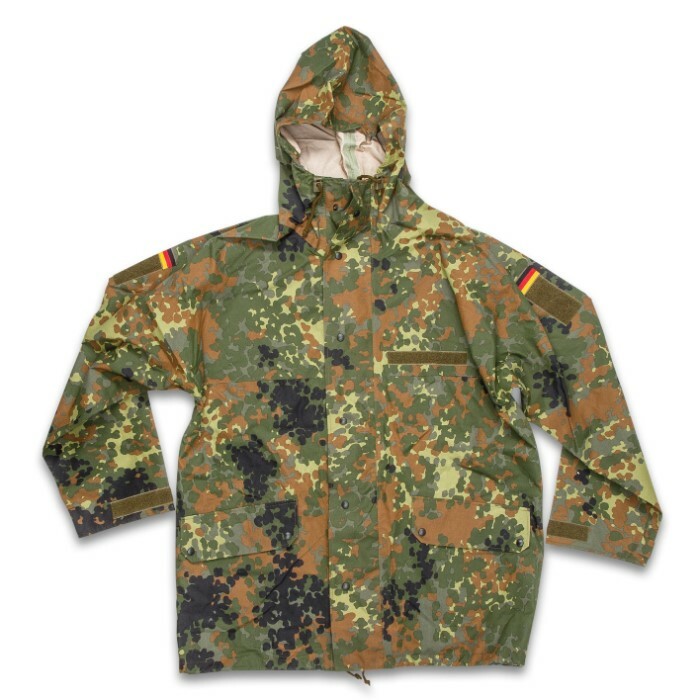 Let the rain pour and the wind blow - even sheets of rain can't stop you in this fortress of a wet weather jacket! 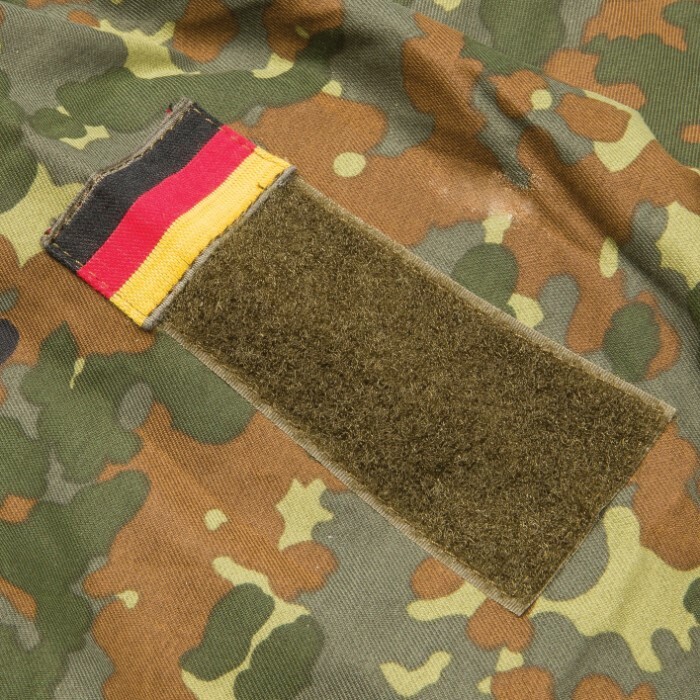 Genuine military surplus, it's standard issue for troops in the Bundeswehr, Germany's hard-fighting armed forces. And if it's good enough for soldiers in today's harrowing war zones, you can rest assured it'll stand up to the worst, most brutal conditions you - or mother nature - can dish out! This distinctly modern all-weather coat is made of state-of-the-art Gore-Tex, a waterproof-yet-breathable fabric that's both extraordinarily tough and remarkably lightweight. Composed of a stretched material similar to Teflon, Gore-Tex repels liquid water while allowing water vapor to pass through. 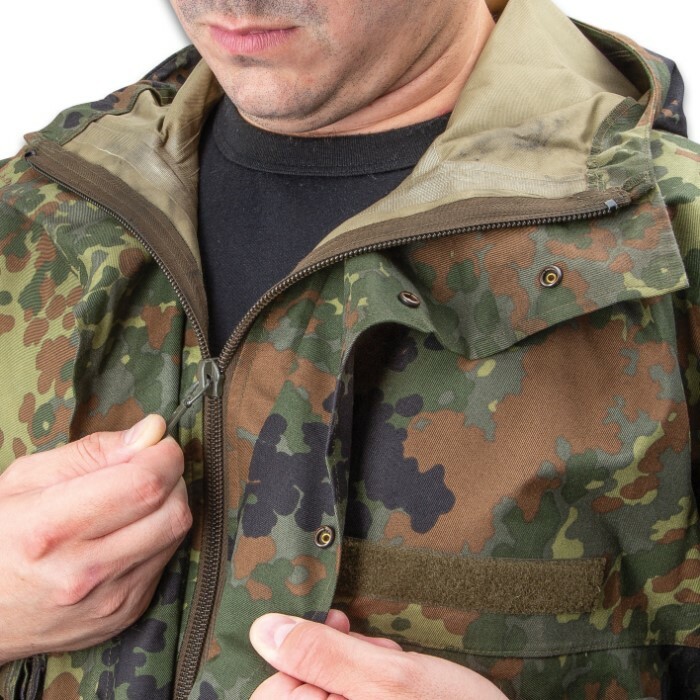 Simply put, this cutting edge jacket keeps you cool, dry and comfortable in a vast range of weather and climates; it's far more versatile than any coat made from cotton, nylon, polyester or other more traditional fabrics. 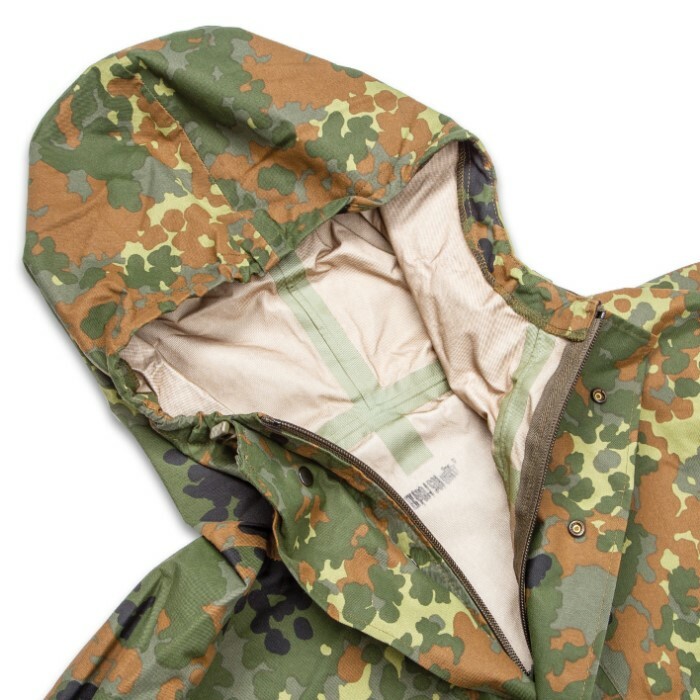 The hood and adjustable cuffs allow for even more protection against the elements, while the advanced Flecktarn camouflage keeps you well-hidden in woodland environments. This multitalented jacket even keeps your "stuff" cozy and dry, with its generously sized waist pockets. Each pocket includes flaps, snaps and a heavy duty zipper, ensuring the contents stay put through even the most vigorous activities. 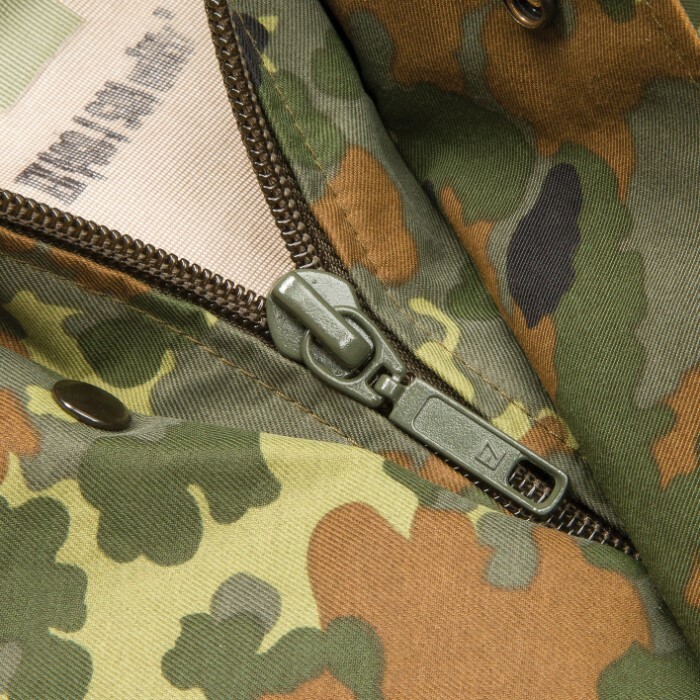 Best of all, this genuine military surplus jacket is remarkably affordable! So why pay more for an inferior coat? 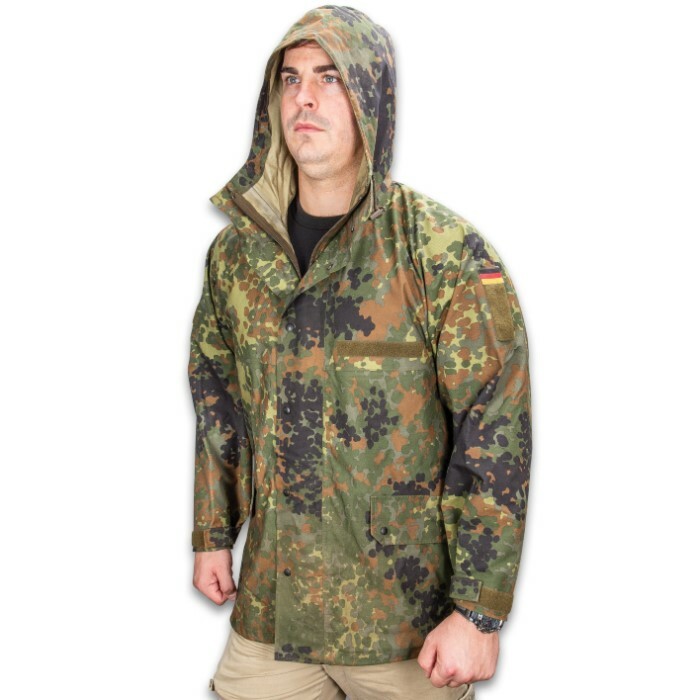 Get military-grade weather protection at a budget-grade price - order the German Military Surplus Flecktarn Wet-Weather Jacket today! Hurry - supplies are limited! These rain jackets are great ! Top German quality. The other review says it all ! This website had the lowest price I could find on the net. Great customer service too ! I will order some more of these as the two I bought look brand new. You can buy with confidence from this site !! If I could give these jackets 10 stars, I would !! Enjoy !! I thought this was going to be a cheap reproduction. Man was I wrong. It looks new, but there is a hand written name on the label inside...so it was issued. Excellent condition. The label itself is in German. The jacket does appear to be Gore-Tex. Nice light rain jacket. Easily packable...or at least rolled up. I think I'll order the pants too.